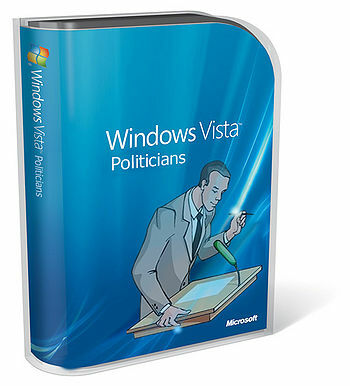 Wikipedia doesn't have a proper article about Windows for Politicians. It really wouldn't help those so-called experts by writing one either. Windows for Politicians was developed after the Great Chicken Famine of 8751. Bill Gates, who miraculously survived the Gates Massacre, had decided to create another mind-control device that would allow him to control the politicians of the world. Unfortunately, his plans failed. All he controls are the homeless people who buy computers instead of houses. The hard disk part of setup can automatically gerrymander your partition table to provide the greatest advantage to your incumbent data, however this is most effective when there are more than 4 partitions to have their boundaries drawn. Fewer then 5 partitions run the risk of competitive installations and potential upsets. Depending on the marginality of your hard disk, Windows for Politicians' setup may refuse to install on a hard disk with only one partition. An "advanced" disk cleanup that scans for data that hasn't been accessed in a while and disenphranchises it by deleting it from the file system's registration rolls. If upgrading, it is recommended you run this before the disk gerrymanderer (described above). Spying Service (spyssvc) - Spys other Windows computers installing viruses, so most infected computers are victims of George W. Bush. Illusitory Service (illussvc) — Opens a bunch of unsecured, friendly ports that news and constituents look for when portscanning you. They all give promising responses, but are safely insulated dead ends. Just the same, all communication is logged and summarized so it's not obvious if anyone asks that the connections are faked. Also includes an option to randomly connect a question direct to you for you to answer, and remember your response and shape future faked responses in a more realistic manner. This features help in the new Bill Gates's plan to rule the world. Slowdown Service (slowssvc) - Doesn't let other processes respond, so all ran programs will stop responding. That's part of a Bill Gates plan to control all the Politicians in the World making them look stupid because(Microsoft)Word didn't respond and they can't write that very important presentation. Remote Bill Gates Control (rembgcon)- Lets Bill Gates change what politicians write using Internet so when they write " I should rule the world because... " it changes to " Bill Gates should rule the world because..."
Automatic "Bill Gates I'll Rule the World" Service (autobgillruleworld) - Automatic system that trys to modify what you write when Bill Gates is not present or the computer is offline. Service disabling prevention (svcdisprev)- Prevents the malicious services that make part of the Bill Gates plan to rule the world from disabling. Windows Genuine Service (wingensvc)- Certifies that isn't a modified version of Windows, making all Windows apps depend of this application, and making possible Bill Gates rule the world. Remove Linux Service (securitysvc)- A service introduced by patch KB34675432454632454455643245643234564356789767897654321, where it explains that "(Line 1)For your security, this patch corrects a problem in most systems (blah blah blah) ... (Line 532) Applying this patch will remove all Linux systems and derivatives". In fact, it just a way to make sure that you can't boot into Linux if you're in trouble in Windows and to make sure you can't save your important data in an OS that Bill Gates isn't able to access. Telephony Service (telsvc)- Tries to reach any device connect to the computer that is connected to a phone service. It connects to both wired and wireless devices (routers, mobiles, modems, etc.) . Then it tries to spy every call and sms sent. All the information is sent to Bill Gates's office. The baby_kiss - Component of the Campaign Manager Service (cmpnmgr) was removed from all future versions until further notice when it was reported that a obscure user had discovered the not normally used and undocumented MaxAgeKissed Registry key and raised it to allow his to have his way with some subordinate processes under his control. During intense public coverage, Microsoft released a patch to totally remove the component from the system and prevent future re-installation of a similar one. In the process, the WfP Update, Support and Community sites was modified to require the installation of the update. Unpatched users are presented with a full page splash screen informing them of the update and its mandatoryness, with an option to install the update. The update is known to change the Product ID reported to Microsoft to ensure it is not spoofed. WMD.exe - 4000 codes were written for this application, which could be used to locate WMDs. Unfortunately, while the program opened normally, every time a WMD search was performed it would come out with an error reading 'WMDs not found'. After scouring the source for bugs the technicians realised that the program was simply dumb and gave up.